Home > Calvinism	> Is John 3:16 The Most Misunderstood Verse in the Bible? Is John 3:16 The Most Misunderstood Verse in the Bible? Well, apparently so according to a post I recently came across (see source below). A comment I wrote in response wasn’t accepted and so I thought it okay to share my $0.02 here. This is perhaps the most oft-quoted, and least understood verse in the Bible. This verse is used by many to teach that God loves all men the same, has provided salvation for all men the same, and it is up to man to do something with it. This verse teaches no such thing! The emphasis in this verse is not the quantity of God’s love, but the quality! Whether the whosoever refers to one man, or one billion men, it has no bearing on the meaning. If only one person was converted by this Gospel, it would not be any less glorious than if one billion people were converted by it. I don’t disagree that there is any sort of numerical value placed upon or within this verse such that the “whoever” refers to one person or all of the world’s population since the beginning of time – or for that matter any number in between. However, it’s with interest that the definition of “whoever” in (what is for me) my trusty Webster’s Ninth New Collegiate Dictionary actually means, “whatever person: no matter who”. With respect, I can’t help but sense that the plain text language of John 3:16 really does mean that God so loved the world that whatever person (i.e. no matter who) believes will have eternal life. To infer anything else here is, I believe, beyond the plain text of this verse and, I think, the context of this passage. To that end, if John 3:16 was the only verse in the Bible, I’m hard-pressed to believe that there would sufficient evidence to support the doctrine of election. This to me, then, is a reasonable indication that this verse doesn’t necessarily support the doctrine of unconditional election. As a non-Calvinist, I struggle with a lot of other verses regarding things such as predestination and election. 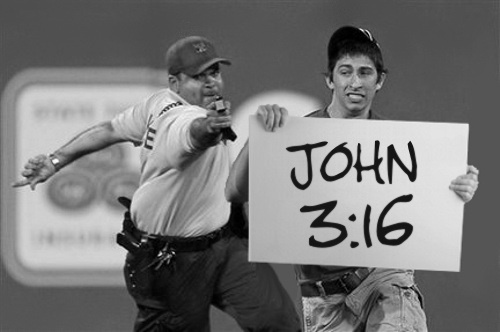 However, John 3:16 isn’t one of those verses. Eph 1:4 – Does It Really Support Unconditional Election? It’s a John 3:16 Mud Fight!